Description: You say you are living for God, but do you enjoy living the Christian life? Have you taken hold of all the promises and privileges that are yours through faith, or are you missing out on much that God has for you? Charles Finney explains how you can be free from guilt and sin and live a life of destiny, clean and pure before the Lord. Read this book and you will: • Learn of the dangers of idolatry • Discern between true and false repentance • Discover the difference between religion and saving faith • Begin to follow the path of true obedience • Walk in the steps of practical Christian living • Experience the true joy of holiness through the Holy Spirit If your faith needs to be rekindled, this book will show you how to experience a supercharged faith! 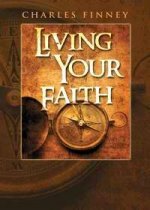 Discover a new power and joy in everything you do as you begin Living Your Faith.